Proving people can live for under 500 Dollars per month in Tropical Paradise locations all over the planet. Yes, you can pay more, and for two people they can live twice as well, however, this is the starting price for Tropical Paradise. This interview explains how she moved down here to teach English, was paid 350 dollars per month that included housing and now lives in a 4000 Lempira apartment as an artist. 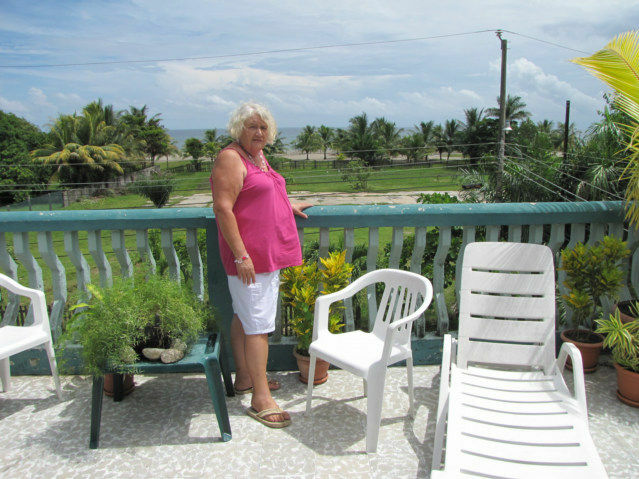 Liz sitting at the table on her balcony in Tela, Honduras with view of beach. The beach is very quiet right now, a few foreigners coming from the Island of Utila or Roatán stop in for a night on the way to the (Spiritair.com) San Pedro Sula Airport. Generally, as best I can figure today, this beach is close enough to the Airport, that there are then a couple of large resorts that are selling tourist package deals in mass. Mainly to the French Canadians, the resorts are "Mas or Menos," but maybe good cheap package deal during the cold of winter. Liz standing on her balcony that is on the third floor and looks out directly at the beach, she is located just to the left of the Telemar Resort, this beach is open to her to use, it is not private or dominated by the Resort. This is the front of the apartment complex where Liz lives. 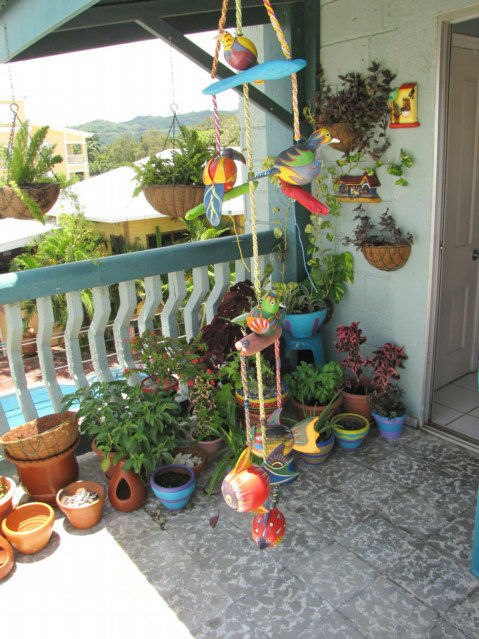 Liz is an artist and has painted and decorated the balcony with colorful clay pots and plants. 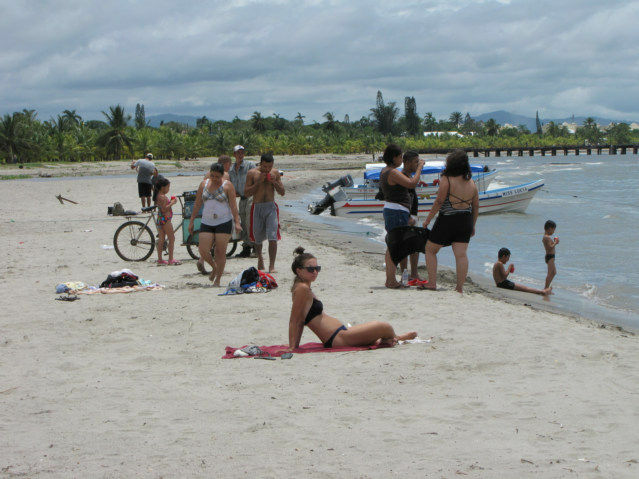 This is the Tela, Beach, an ok beach, not the worlds best, but ok, and maybe more people during the high season. Generally, it is very quiet, and this is a small city of about 30 thousands residents, but has all a person needs. This is only a two-hour taxi ride from the airport, which would cost about 50 USD. There are a few signs around, this is low season so the majority of rooms are empty and the owners are not advertising. As best I can suss out, the apartments start at 2500 Lempira and work their way up to the sky. The easy to find price is 4000 Lempira’s, this is what I am paying, and I have AC, Color TV with Cable, HBO, Cinemax and water, electricity and such are paid by owner. I use a Tigo Cellular Wireless Internet Modem to access the internet; it is fast enough to use Skype.com. I generally minimize what people do in other countries for many reason. Mainly because readers hook onto comments and overvalue them. Tourist sites promote tourist attractions, they are a dime for 10,000 of those types of travel sites..
What generally is 100 percent true of people living in the places I live is they have an over-abundance of spare time. Therefore, they can do whatever they want. People do about the same things in all locations as they did at home. 2. Talk with friends more. What is available in Tela, that is not available in other locations is the ocean. There is an expat community here that seems to revolve around the Restaurant called the Bungalow, or Norms, the food is excellent, and Norm is the perfect person to help people to find an apartment. I do not wish or want to promote tourism, or being a tourist with tourist attractions. Tourist attractions are good for about two days. For example, Tela has what is said be be the number two Botanical Gardens on the planet. The overwealming myth is that you need to be rich to travel or live overseas, the truth is you can live cheaper outside your developed country. This is why I must prove it, and try to stop the myth, this dream is easier than living in the USA, Europe, Australia or Japan. It was about 50 USD or 850 Lempiras for one month and 5 GIGS of transfer, the great part was I did not need to buy the Modem, the one from Guatemala worked. I am thinking there is a universal one that will work. I know on Lake Atitlan they have people arrange the Visas, and the expats do not have to leave every 180 days. The four countries thing that allows people to come to Guatemala, Honduras, Nicaragua and El Salvador as a group is causing a problem. The distance for a Visa run is too far, but personally I want people to stop trying to live forever in destination and choose 3-12 countries per year to live in, this solves the visa problem, and they do not get exasperated with one culture. Some people are Ex Pats or semi Ex Pats and prefer one region or country over traveling 3-12 countries per year. When I was younger I did my world traveling, now I have health issues and keep busy here, as well I am a resident, so I do not worry about "Visas", nor do I have anyone, tramitador nor lawyer nor "local friend" do anything for me that I cannot do for myself. If one does not speak or understand well the local language, by all means ask long term Ex Pats, experienced travelers and local friends for help and guidance, people you have met face to face or know from previous visit to area, not on Internet BB's or forums. If I had the money would probably move to New Zealand tommorow and stay!!!!!! I enjoy being with independent travelers on a budget, I despise being around "cheap" people always seeming to be counting their money..called Tacaños in El Salvador and Guatemala, in fact is embarassing to me and my local friends. People fly to San Pedro Sula which is a lot closer than Tegucigalpa with Spiritair.com.... I do not know about this 9 dollars club, think of great value for someone who lives in Fort Lauderdale the base for Spiritair.com. There promotions do not include taxes, they are about as up front as Ryanair.com. What does Liz do for fun... hmm, I am not sure. I met her at the Lempira Hotel with a guy by the name of Zack. David and Nicole two French Canadians are making a tourist hotel there and Liz was painting a Mural. David and Nicole are big Harley Davidson people, not my ball of wax, but they are nice people. They talk a lot about their Chef, I turn my brain off when people talk Tourist Priced food, I can be at home and have that. I on the other hand am eating great Tortitlla Harinas here with Habana sauce that is a WOW, for 50 cent U.S.
What does Liz during the day? I will try to ask, she says she walks to the beach every day, but she is white as piece of white paper. 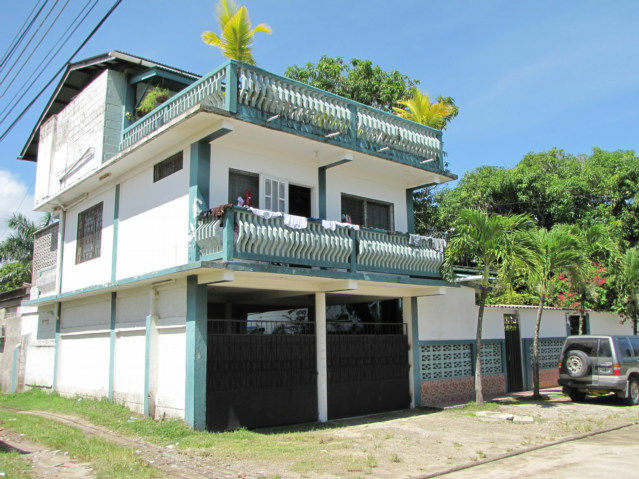 Life in Tela for an Expat must revolve around locals, there is not enough Expats here say there is a colony. I personally walk to the Central Park twice a day, then walk around on the boardwalk on the water. Sometimes I walk down to Davids Hotel the Lempira and talk, but this is nutty, they work, make noise and are the American culture moved here, they want to make money ,make money, make money. I am into talking and conversing with friends, not talking about making money. Liz on the other hand is just having fun, she had a simple life and can do what she wants, she is not involve in this make money life that could be better done back in Canada. If I wanted the stress of running a Brick and Mortar business, I could make more money in the USA, and not have to deal with the culture here. Live life is what Liz does, the same as she would in Canada, she has a better climate quality of life, and does the same things she does in Canada for one tenth the cost of living. Being rich is always beneficial, she is Rich here, while she would be almost poor on the same budget in Canada. This is about leveraging your money or budget to increase the quality of life.... but do what we enjoy the exact same as at home. Spirit Air...go for it, some complaints about service and charging for carry on luggage, hub is Ft. Lauderdale, FL USA check them out https://www.spiritair.com/Reservations.aspx, I may fly from GUA to LGA in September if I get a good deal. Taca www.taca.com is usually more expensive FROM C.A. to USA. Also the Panamanian Airline Copa FROM C.A. to USA has good service www.copaair.com often specials online off season travel. Those staying over 90 days must apply for an extension at Immigration Office of country you are to stay in, or goon to Mexico or Costa Rica by landor air and return 72 hours for new 90 stamp. Simple as that. Visas are not required by British citizens to enter Guatemala and can visit freely for up to 90 days. If your stay in Guatemala is longer than 90 days you should go to the General Directorate of Migration in Guatemala to apply for an extension to the 90-day rule. If you would like to clarify any other information on entry requirements you should contact the Guatemalan Embassy in London. Washington DC, Ottawa etc.or any CA4 consulate or embassy nearest your home. Central America Border Control Agreement. Guatemala is part of the Central America Border Control Agreement (CA-4). Under the terms of this agreement, British tourists may travel within any of the CA-4 countries (Honduras, Nicaragua, El Salvador and Guatemala) for a period of up to 90 day, without completing entry and exit formalities at border Immigration checkpoints. This period begins at the first point of entry of any of the CA-4 countries. Fines are applied for travellers who exceed this 90-day limit, although a request for an extension can be made for up to 30 days by paying a fee before the 90 days limit expires. If you are expelled from any of the four countries you are also excluded from the entire CA-4 region. There is a US$30 (or Quetzal equivalent) airport departure tax which is normally included in the price of the ticket. An additional security tax of US$3 is payable at the airport. For internal flights there is a five Quetzal per person travel tax, which is also payable at airline check-in desks. When crossing into Guatemala by land border, there have been numerous reports of customs/immigration officials charging an "entry fee". This is illegal. By asking for an official receipt for your money you may find that the "fee" is dropped. Single parents or other adults travelling alone with children should be aware that some countries require documentary evidence of parental responsibility before allowing lone parents to enter the country or, in some cases, before permitting the children to leave the country. For further information on exactly what will be required at Guatemalan immigration, please contact the Guatemalan Embassy in London. Washington DC, Ottawa, Ontario, Canada etc. 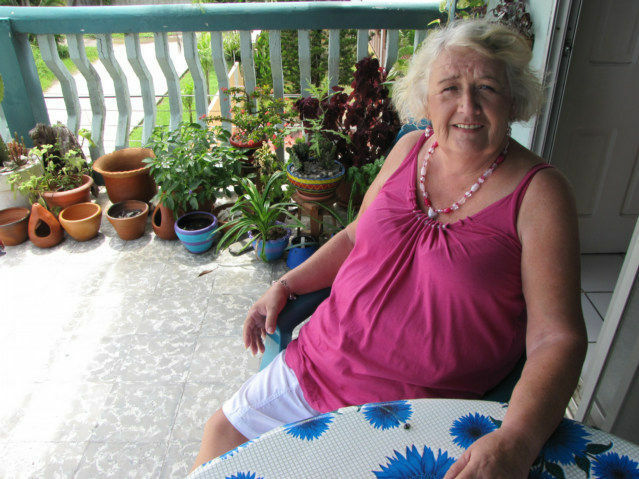 In the 1980s and up until about 2003 I was a working Ex Pat and most of the Ex Pats I knew, the permanent ones, not snowbirds nor PTs, worked, from teaching English to working in tourism to owning a small business, most all of us legal with residency. I admire those who find their niche and stick out through thick and thin. Returned to Central America to livein 1985, we had no Internet, cell phones, Skype, magicjacks, calling the USA or Europe was expensive then, now 10 cents US minute on my landline or cell 24/7, when friend brings back my magicjack from US later this month calls to US and Canada will be free, phone set plug in, dial, no software plus I will havemy own private US number. To Chuck Wow, I live here in Central America, so would leaving from GUA Guate City, which is 1500+ meters above sea level and downright chilly in the morning, wonderful idea!!! I buy used clothes in USA at Goodwill anyway, will wear 5 pairs of everything when I board Spirit Air and bring a thin plasic bag to pack aboard. The only other thing I will have is a book to read. Will return with some luggage, but worth it. Thanks. If you are active like I am, know few ex pats anyhow, and do not drink (boozing magnifies your character defects, boozers tend to hang around bars, lions dens for me, since I am no lion tamer..well anyway 20+ years ago hung around the gringo bars when I was idle, got me nowhere fast, everybody put down everyone else down behind their back.) you'll not have time to gossip much. Pretty much human nature, every subculture has a pecking order, when our group of homeless vets many years ago in Miami USA got food stamps and benefits we rose high on pecking order of homeless. Envy, greed and jealousy, been there, done that. Today I take an inventory every night, try to best of my ability to cope, help others less fortunate if possible, be kind. "Thanks for the great inspiration Hobo, I will be leaving the 'working world' soon and headed out on my own trip -first the US and next the world!!" Good luck traveling the world, aside from Canada (I went to 'Protestant Public School' in Montréal 1961-62, nice break after 9 years of Catholic Private School in Virginia USA..and I had a first generation Jewish Mother and Agnostic Dad from New England, 1963 and 64 was public school in small town Va. easy. people far more important than any detination, in my opinion. below is a humorous bloq done in 2008 by a surfer dude from USA visiting El Salvador, we met him down at the Beach, only 36 km. from capital city of El Salvador, this bloq is funny, real and has some beautiful photos, I myself cannot afford to carry resentments, anger, rage, envy TODAY. Sorry have no comments on politics nor religion, nor shall I.
i have now magicjack so can call anyone free in US or Canada, I will give you a one hour seminar on living, working and volunteering overseas, this site hobotraveler.com has a tremendous amount of advice, photos and articles, links, just gotta search, also Wiki Travel for your target country, city, town or region will gt you started..Google. Bon voyage, gute reise, buen viaje, safe journey. 1. 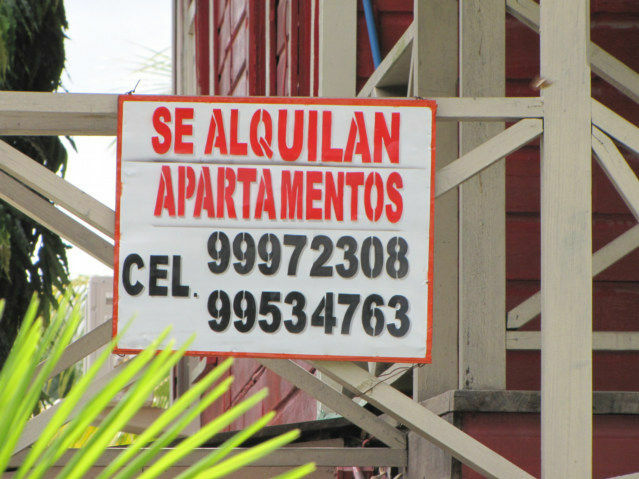 The lowest rent to natives, as they are local and may have either family, business or social connections with the landlord. 2. Higher prices to foreigners, 100 of wannabe ex pats or semi ex pats (those who stay 6 months during the 'high' or dry summer season) arrive to the country on a tourist stamp, which to me, if I was renting, anywhwere in the world, I would of course charge a tourist (offically in the country, upon entry, by immigration law in any country in the world, unless you have a business, residence visa or work permit issued by that countries Consulate or Embassy, you are a 'tourist', not an 'experienced traveller' you can use that monniker on websites and forums one upping newer travellers or wanabe ex pats). A tourist is transient, has no ties to teh community, so there is no trust that the tourist will break the rental contract and go elsewhere at any time, in Maine, where I lived when I was young, heard a rental agent tell irate tourists complaining about summer rental prices..."IF YOU CAN'T STAND THE WINTER HERE, DON'T COMPLAIN ABOUT THE SUMMER PRICES"
So be polite and try to bargain, having a native with you will be a big plus and you will avoid any misunderstandings. The Internet or via a local Real Estate Agent (usually an American or Canadian grifter or grafter in places such as Antigua, Roatan and Utila, perhaps Tela now as well, Granada, costa rica and Panama and now Ecuador is being ruined. Buena suerte y buen viaje. Travel to your target destination, start by renting a hotel room that suits your budget and go from there. saludos.